Remember what a broken sewer line meant in times past? It meant tearing up your lawn, yard or driveway and digging up trenches just to get to the busted sewer. After the trench was covered and the sewer line replaced, you’d have to start from ground zero, planting and nurturing the grass in order to get the lawn back to where it was before the repair. If the sewer line passed underneath the driveway, it had to be rebuilt. That was taxing, not only for the one repairing the sewer, but to you and your family. Thanks to new technology, sewer line repairs are far more efficient than they have ever been. Trenchless plumbing has opened up the door to new possibilities so people don’t have to go through all of that hassle anymore. This advanced technology is as efficient as it sounds. Your damaged sewer line is repaired without digging it up. Cured in Place Pipe (CIPP) is used to reline the inside of a broken sewer line. A PVC liner is blown inside the host pipe to cover the sides of the sewer line. The new seamless liner that is blown into the existing sewer line is pressurized with scalding steam so it is kept perfectly in place. It’s fitted just like a second skin to the existing sewer line to give it the boost that it needs to repair the crack or leak. This instantly restores the line. No damage is done to your patio, lawn, and yard. This method is not labor intensive. Less time is spent on the repairs. The new re-lined PVC is highly resistant to root infestation, leaking and cracking. Damaged sewer or water lines that have been damaged by elements such as freezing. Sewer lines that have been damaged over time. Cracked or leaking sewer lines. The connection of sewer lines to the city main. If your sewer line needs replacement and repair, call Trusted Plumbing and Heating to find out if trenchless is right for you. We do an assessment so we can properly advise you on what needs to be done for your underground piping. If the damage is too intensive for a repair, we will advise you on trenchless pipe bursting. Trenchless pipe bursting involves replacing the damaged pipe with a new one altogether. This method only applies when the sewer line is damaged beyond normal relining. 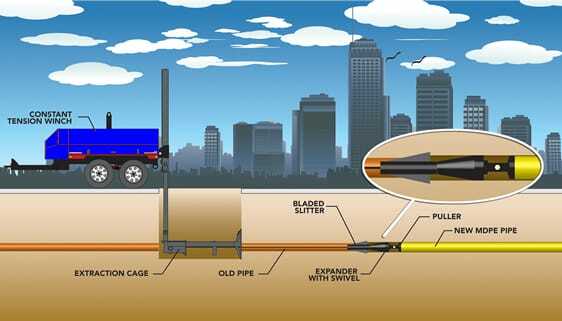 In order to solve this problem, we feed a thick cable through one end of the sewer or water pipe to the ether end. A cone shaped tool called a busting head is inserted and sent with pressure through the pipe. It breaks the pipe around it as it pulls the new pipe into place. The new one effectively replaces the existing damaged pipe without breaking any ground. This method is time and money saving and equally effective. Trusted Plumbing and Heating is your preferred partner in trenchless sewer line repair. We have been using this technology in Seattle, Bellevue, Everett, Lynnwood, Tacoma, Puyallup, Kent, Federal Way, Tukwila, Kirkland and Woodinville for over ten years. Call us today to see if this method is right for you.